Making jewelry more versatile has been a trend for a few years now. Remember those watches with the beaded bands on stretchy cord? The bands clipped onto the watch face and you could change the watchband to match your wardrobe choices. It was a great idea, but people jumped on the bandwagon as the fad swept through. There were people who made some awesome pieces with very artistic arrangements of beads and stones. They took the time to find unique and better quality materials for their pieces. Then there were the sellers who came late to the party and rushed to make watchbands from beads we've all seen at Michaels, Jo-Ann's, and Hobby Lobby. Every craft fair or boutique seemed to have at least 10% of the booths selling these watches and bands. Why don't crafters take the time to put their own twist on an idea? They need to think like artisans instead of just trying to copy what they've seen. What can I do with this idea that will be different from what others are doing? Style, uniqueness, and quality of materials can make all the difference. 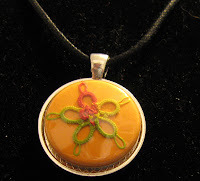 The latest interchangeable jewelry item is necklaces that have a magnet on the pendant. These have been played with for awhile and now they are taking off using pinback buttons as the removable design element. I hadn't seen people wearing buttons much since my jr. high school years, but now they're making a comeback. JC Penney did a promotion during the Christmas shopping season where they gave out 1-inch buttons with a code on the back. Some of the codes were linked to prizes. People were wearing clusters of buttons now on their shirts and jackets. We purchased a machine to make the one-inch buttons. This is no cheap investment! You also have to research the options since a machine with plastic parts will break sooner and some machines have parts that are slightly different from the more common sizes, leading to difficulties purchasing new supplies. You can get a variety of different backs for these buttons - zipper pulls, pins, tie tacks, earrings, magnets, and flat backs. Our twist on these versatile necklaces is to keep with the theme of our Etsy shop. 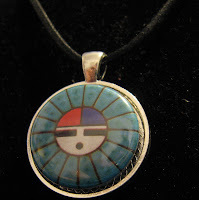 We have buttons done in some cool Native American designs. I also made some with tatted motifs. That was a challenge since I had to use the smallest threads. It's cool to see the tatting under the Mylar cover of the button. That's one way to keep your tatting clean! We created a new section for the shop where people can buy the necklace base and different sets of buttons. I guess I'm one of those people who can't just sit back and do the same old thing. Boredom sets in quickly and I start trying new things. Fortunately, I married someone who is equally restless. We really like to change things up every now and then. To begin the year, I invested in a button machine for making 1-inch pinback buttons. These are the popular little buttons that you'll find people wearing now. JC Penney used the 1-inch buttons as part of their Christmas promotion. 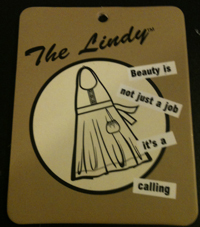 Holiday designs were on the front and promotional codes were on the back. One of my promotional codes got me a $5 gift card at Starbucks! What are we going to do with our new piece of equipment? There are a lot of people on Etsy right now making buttons - some with cute or snarky sayings and others with images of popular movie characters or symbols. If you've been following me for any length of time, you know that I'm not going to go in a "normal" direction. The first thing I did was to tat some small motifs and make them into buttons. I quickly learned that I have to use very small thread and to be careful to use thin paper as the background. The effect of having the tatting encased under the mylar cover is pretty cool. It's hard to capture it in a photo. The next step will be to do some unique Native American designs for our shop. I think we could do designs similar to the ones my hubby has etched on stone and cut out of vinyl. We're talking about some other options for when we sell at the powwows. Yes, we might have more sales by doing something from the latest movie or TV show. Our son has a friend who has made a great business off the popularity of Harry Potter. That's great for her, but I don't want to follow the fads or use other people's work. We may not have enough sales to quit our day jobs, but we are proud of our work and what we have to offer the world. I had so much fun reading your comments on my post about the Grandway apron giveaway. There were great comments on my other blog, too. In addition to all the great family cooking memories, I loved reading about kitchen and cooking disasters. 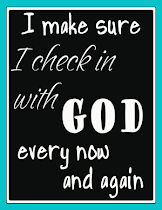 I guess it helps me to know that I'm not alone. Not every woman is perfect in the kitchen, even if her mom or grandma was a great cook. At least with an apron like this, you can look good while serving something burnt, deflated, or somehow slightly off from the recipe. With so many great entries, I turned to a random number generator to pick the winner. Holly S. is the winner of the apron. She mentioned that her mom was an insanely great cook, so I'm not sure if she is keeping the apron for herself or giving it to her mom. I will contact her and give her 48 hours to respond with a shipping address. I guess everyone has their own resources for inspiration. 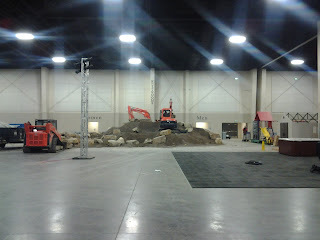 The hubby and I love to go to all the different shows that come to the South Towne Expo Center. These shows are the closest thing we have to a date night and we find inspiration there. 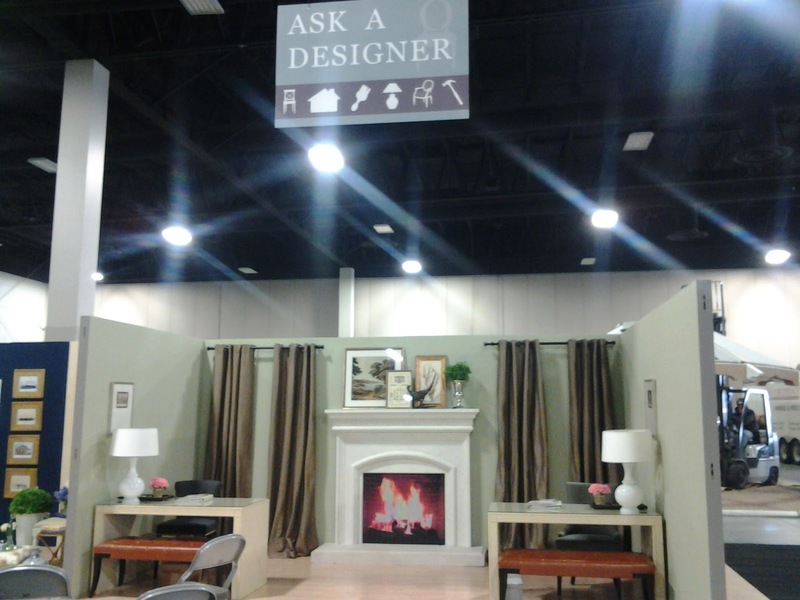 It's one of the first places most people will see the latest trends for home design and landscaping. We like discovering new products there as well. 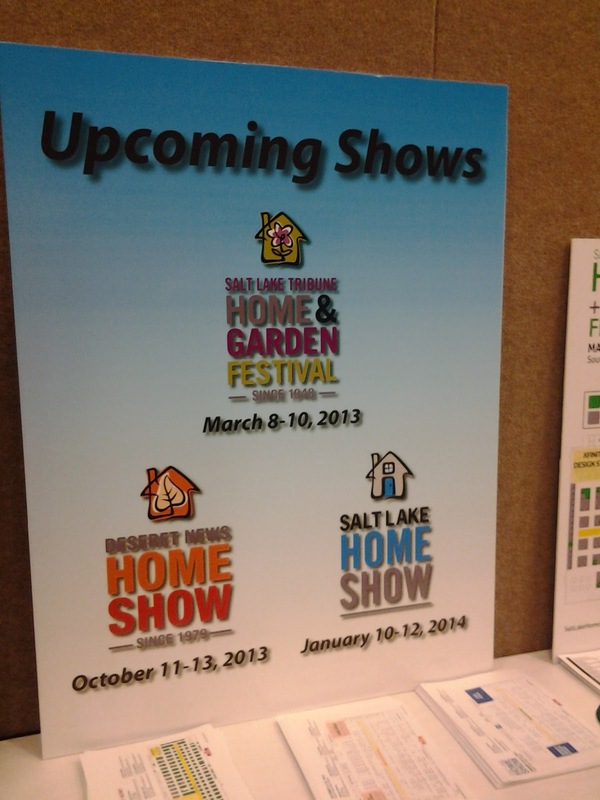 Today I was treated to a bit of a sneak preview of the Salt Lake Home Show which is opening tomorrow. Opal Design Group talked to our little group about home design. 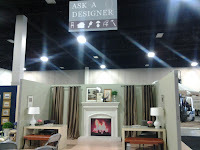 They are giving free design consultations at their booth at the home show this weekend. 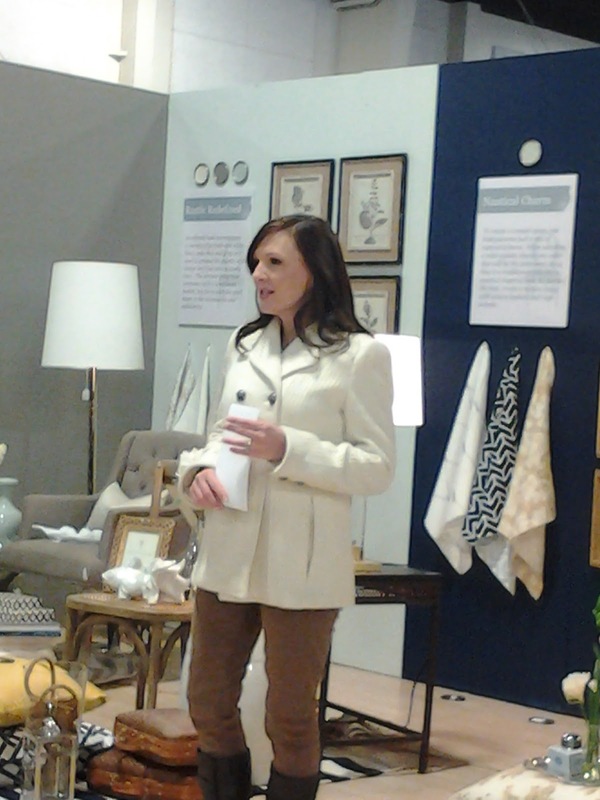 Some of the tips they shared today go beyond just how to decorate your home. Knowing the latest design trends helps those of us who are selling products we hope someone else will use to decorate their home. Trends/fads come and go. If something seems to get crazy popular, you know it will die out at some point. Decorators look for both the trendy elements as well as the classic ones so the look doesn't get "old" too fast. When asked about current popular trends, some of the home design bloggers mentioned polka dots, vintage inspired, industrial, reclaimed woods, and airy/light bright colors. The designer mentioned that they noticed color trends changing in some of the design markets they've attended. Heavy, saturated colors are coming in (like turquoise) and warm gray has become the hot new neutral color. With the way we're all connecting online, a more global influence is being seen in decorating. I know I've already seen the Asian look in a lot of design elements. One trend that is getting popular for smaller spaces is transparent furniture. Knowing these things will help me as I plan to create new products for our Etsy shop. I may not be able to make transparent furniture, but I like using saturated colors of thread for tatting and it's nice to see that repurposing and upcycling of materials is still "in." 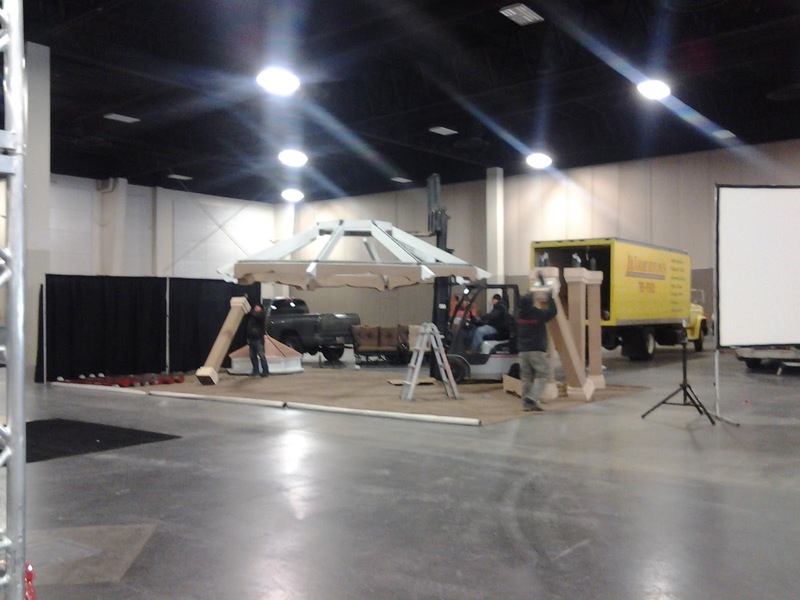 One of the more exciting parts of my day was seeing how they put it all together. I'm very much a "behind the scenes" type of person. The heavy equipment was out building those mounds of dirt and rocks where potted plants and trees will be placed and the vendor will have people dreaming of amazing landscapes. 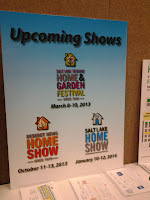 If you're in Utah and want to attend the Salt Lake Home Show, tickets can be purchased online. Use the Promotion Code SCRIBNIA for $3 off your ticket. Ty Pennington from Extreme Makeover: Home Edition will be there on Saturday. Click on over to their website to see the schedule and the list of other celebrities. Military, Fire, & Police admitted free. To receive a complimentary admission pass simply show your valid ID at the information desk at the entrance to the show.